For the past 10 years my paintings have lived in the world between figuration and abstraction. From a distance each painting shows a recognizable image, but as the viewer comes closer, the work appears to fall apart into abstract squares with color the only unifying factor. This phenomenon creates different relationships with the work and completes the viewing cycle, inviting the viewer to be an active participant. The viewer’s experience and exploring color are the driving forces behind the paintings. I employ digital technology, breaking down the information the viewer reads, changing their focus and perception. A first step is determining the rate of pixelation and scale of the individual units relative to the overall size of the piece. This ratio determines how the viewer can read the painting and finalizes the composition, but it is only the starting point for the painting to take on a life of its own. 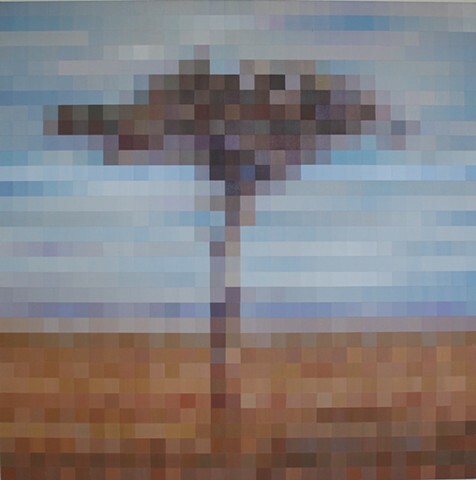 I base the paintings on pixelated travel photographs. The inspiration came while I was bouncing in a Land Rover across the Masai Mara in Kenya. I was struck by the totality of the Mara but even more by how movement affected my visual reading of the place. The methodology that I then developed seeks to capture a sense of time and place – a conduit to relive the experience and to invite the viewer to return with me. On subsequent trips to Indonesia, Europe and South America, I’ve witnessed globally how different qualities of light profoundly affect the definition and interpretation of form. For that reason, travel has become an integral part of my investigations, yet the paintings go beyond a travelogue.